Our Delta Bridges provide a proprietary pre-engineered modular bridging solution suited for long-term or permanent applications on main highways or in rural areas. 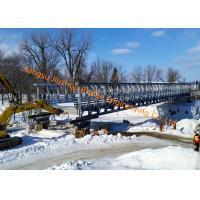 It uses standardised, interchangeable steel bridge or steel structure components with full highway loading capability to provide a permanent, lightweight, steel bridging solution which can be configured for clear spans of up to 80 metres or even longer . It can also be supplied in multiple spans, supported on intermediate piers, meaning that there is no limitation to the length it can bridge. 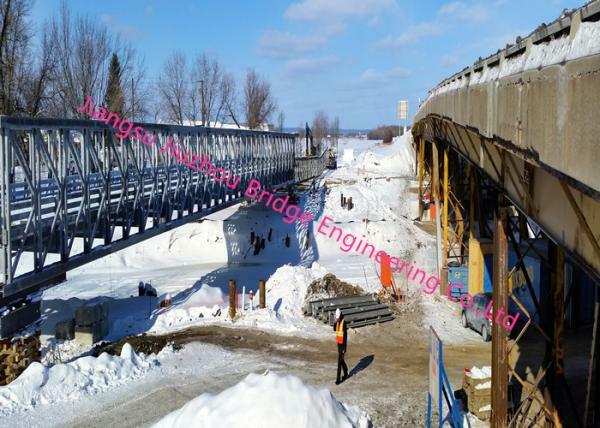 Combining the best of off-site fabrication with high speed construction and rapid installation, our Delta Bridges offer significant advantages over more traditional construction techniques which involve major site work. 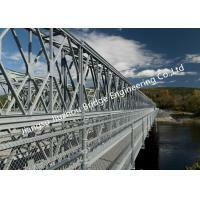 The versatility and robustness of its design means that it can be easily assembled and dismantled, making it equally suited to long-term or temporary bridge applications. 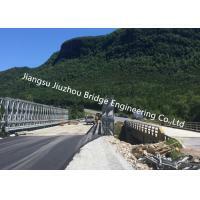 Jiangsu Jiuzhou Bridge Engineering Company can supply a solution to suit your particular requirements and we are able to accommodate any special load requirements as well as site specific topography, extremes of temperature, high wind loads, and seismic requirements. 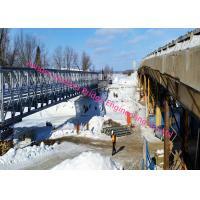 From material purchase and tracing, planning compilation, drawing detailing, production arrangement, quality inspection, to on-going painting, packing and delivering, we have separated department to strictly control process, quality and traceability, so that the perfect Bailey/Belay/Baley Bridge can be made. Finally we would like to emphasize that not like other companies, nearly all machining parts and mechanical accessories are manufactured in our own shop as we have so many wonderful machines and workers inside. In this way, the quality, cost and delivery time can be ensured which eliminates other exterior factors’ influence. Warmly welcome all friends and clients from International market to visit us! 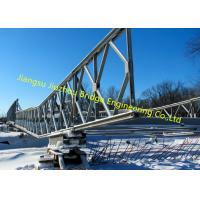 Jiangsu Jiuzhou Bridge Engineering Co.,Ltd. (shortly called as JBEC) lies in Huashan Village, Yaoqiao Town, New District of beautiful city-- Zhenjiang, Jiangsu Province. It covers an area of 80,000 square meters. The traffic is very convenient. 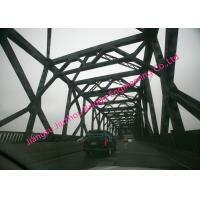 It is 30 kilometers away from Changzhou Airport and five kilometers from Huning Motorway Entrance& Exit. By Train it is only 1 hour away from Shanghai, the largest city of China. Our registered capital is RMB22 million Yuan, and now JBEC have over 100 million Yuan in total assets. The annual production capacity can reach more than 50,000MT. JBEC have over 200 staff and workers overall and over 50 professional and technical personnel. We invite senior engineers and specialists of China Steel Structure Association Councilor and Scientific department of the General Equipment as our consultants, and hold technical communication meetings time to time. Most importantly, not like other companies, nearly all machining parts and mechanical accessories are manufactured in our own shop as we have professional machinery line and skilled workers inside. In this way, the quality, cost and delivery time can be ensured which eliminates other exterior factors’ influence. We have passed the ISO 9001:2000 International Quality Management System Authentication. The company is recommended as the Demonstration of Quality Management by China Quality Observation Station; Safe Production Advanced Unit by the city government, Industrial and Commercial Relief Enterprise by the city Industrial and Commercial Bureau in 2016, Rank A enterprise of Labor Protection by the city Labor Bureau in 2016, A business tax credit of Zhenjiang city in 2007. At the same time we declare the patent of the technology production and the practical production of Equipped Road Steel Bridge to National Knowledge Property Right Bureau. 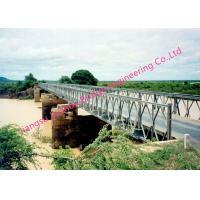 Our main production is various steel-based bridges, in which Bailey Type Steel Bridge is the most advantages. Meanwhile we are developing new models of various prefab steel bridges with state-of-the-art technology absorbtion and development. We adopt the Road Bridge Construction Technical Rules (JTL041200) by the Ministry of Communications to process, and make the steel bridge, which is simply-structured, conveniently-transported, strongly-suited, well-exchanged, rapid erection, and huge load. It is widely used in national defense equipment, flood fighting, transportation, irrigation works, railway and so on. 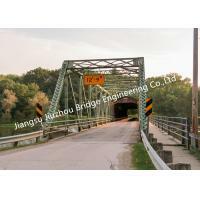 We also specialize in producing the derivative product of steel Bailey bridge, such as panel pin, nonstandard transom, bridge deck, female end post, male end post, bridge seat, baseplate, reinforced chord, clip and so on. All the machining accessories of Bailey type bridge are done by ourselves, which can control the quality, cost and delivery time. Our company undertook the construction of national key projects form China Railway Bridge Bureau, China Tunnel Traffic and China Railway Shanghai Bureau. And the qualities are quite good. Because of the good quality, our productions are exported widely wordwidely like North America, Europe, South America, Middle East, Oceania, Africa and Asia countries such as Chile, Costa Rica, Ecuador, Canana, Australia, New Zealand, Laos, Angola, Saudi Arabia, Poland, Romania, Kenya, Nigeria, Bangladesh and Myanmar etc. So we are widely received and accepted by the international markets. To satisfy the demands of the market, we set up a renting company in 2016, which rents Bailey Piece and a complete set of steel bridge as well. 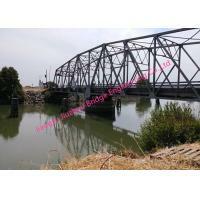 It also forms a professional bridge erecting group. Nowadays, Jiangsu Jiuzhou Bridge has formed a supermarket of steel bridge which combines design, making, fitting, renting, transportation to become a first rate enterprise. The company will takes full advantages of flexible mechanism and strong technical force, be market-oriented, adherence to the “customer first, quality first and integrity management” as the quality policy and “quality and creditability” as the enterprise tenet to ensure that customer requirements are satisfied and translate them into the demands for products and service. It provides the high-quality products and service for customers and try its best to create band and credibility, enrich the outstanding professional personnel, creates benefits with scientific management and advanced technology to create a first-rate steel structure enterprise. Now JBEC has reached a strategic cooperation with professional structural steel engineering specialist called Hangzhou FAMOUS Steel Engineering Co.,Ltd. (FASECbuildings) and realized a win-win cooperation. 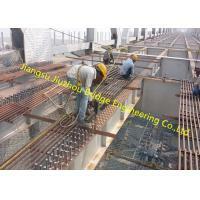 Lastly we would like to emphasize that we are able to do various standards structural steel fabrication ranging from normal China standard, to Europe standard, America standard, British BS Standard, Australia New Zealand AS/NZS standard and steel based bridge construction upon different clients' requirement. JBEC is willing to create a better tomorrow with you! Warmly welcome various clinets either from Domestic or International market to visit us!